Jorge Rivera at BookExpo 2017. On Thursday, May 31, I registered myself at BookExpo in New York City's Javits Center and went to the press room to see if there were any handouts. The pickings were slim. 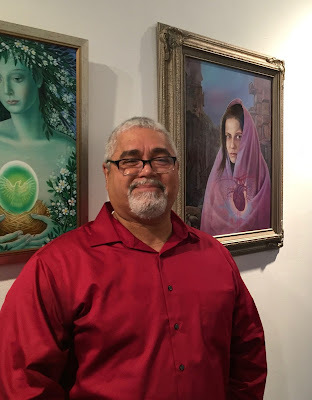 However, I arrived at the same time as Jorge Rivera, who was with an associate Elizabeth Pierce promoting three of his books and three other books by someone else, maybe her under a nom de plume. His six-book backlist is promoted as Hamilton Rand Publishers, which he says is a nonprofit organization that is a successor to a company formed in London in 1907. It is incorporated as a 501-c-3 company and is based in the Los Angeles area. His six-book backlist focuses on adult nonfiction. Rivera's own three books are about weaknesses in the international financial system. The Hamilton Rand website establishes the concept of the nonprofit as pursuing the goal of reducing financial illiteracy by bringing in strategic partners (an impressive group of logos is provided on the website) to make possible publication of new books in this arena. Rivera worked for several decades at the World Bank and IMF in Washington before he launched himself on a publishing arc. 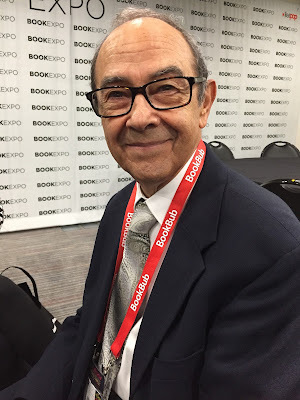 One question I started asking him was: What is the minimum size that a publisher needs to be to justify a booth or table at an event like BookExpo, especially when two people are traveling from Los Angeles? A quick answer is that Rivera is a startup and is aware that his backlist is not big enough or popular enough (six Harry Potter books would be enough, of course!) to justify his paying for a publisher booth. So instead he has paid for half an hour at the BookExpo to sign books, at Table 16, on the second day, June 2, from 1 to 1:30 pm. This is less costly than paying for a booth. The cheapest show-long space at BookExpo is $1,900 in the Indie Book area; that pays for a table with enough space behind it for two or maybe even three people. A proper booth is regularly $2,500 and a good-sized booth that I have seen shared between two book-related companies is $3,000. In other words, you get more for your money once you have pierced the $1,900 threshold. Rivera's first two books identify him as having a Ph.D. degree, I think he said in economics. He did not have a copy of his latest book, Money & Greed, to give me, so I am summarizing what he told me. His book is based on a true story. A young woman had three summers interning at the U.S. Treasury to investigate fraud. She was then hired by the FBI White Collar Crime unit to look at the handling of long-term deposits from disabled customers, a vulnerable group. She went to work for the bank under investigation, which was in Louisville, Kentucky, and she became executive assistant to the President. She got an inside look at how the bank worked, and it deceived its depositors. Money was taken out and used to purchase collectibles for the collecting-addicted bank officers, the president, chief financial officer and the corporate secretary. In the final chapter of the story, the art collection and real estate assembled by the banksters had to be sold in a hurry to make restitution to the depositors. The book's author confesses to having some empathy for the guilty bankers because they were apparently charming and had real taste in art. Rivera's new book sells for $25 in hard cover and $20 in paperback. Usually I see more of a spread in the price between these two formats, like $30 hard cover and $20 paper, or $25 hard cover and $15 paper. I will be interested in seeing how the nonprofit indie publishing model works in this case — it is of course the model for academic publishers. The CHOICE Act —seems to renege on promises to the middle class and actually sacrifices the middle class for tax cuts. The "Mnuchin Rule" — while he was Secretary-Designate, Mnuchin told reporters immediately after his nomination that the Trump tax plan would not net the wealthy a tax cut. Mnuchin continues to stand by it. Passthroughs — Sen. Warren appears to have exacted a promise from Sec. 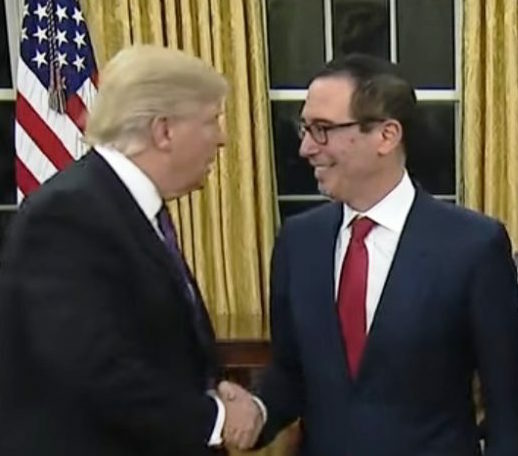 Mnuchin that the S-corp passthrough will only be available to small and medium-sized business owners. Foreclosures — Sen. Cortez Masto grilled Sec. Mnuchin about why his leadership team has no one advocating for borrowers or homeowners. Export-Import Bank — the Secretary heard appeals for full Bank reauthorization from both sides of the aisle. Orderly Liquidation Authority — Sen. Warner advocated preserving the authority extended to the FDIC to resolve non-banks. Sen. Shelby called on Sec. Mnuchin on the S-corp pass-throughs and how Mnuchin had promised to not give a tax cut to the wealthy. Mnuchin responded that "we are committed to make sure that rich people do not use pass-throughs as a loophole to pay lower rates. … So we do want small and medium sized businesses to have the benefit of lower taxes." Sen. Reed said giving up the Orderly Liquidation Authority would deprive the system of its main defense against bailouts and sought assurance that taxpayers wouldn't bear losses under OLA. Mnuchin concurred that something drastic would be necessary in such a situation. Sen Warner reiterated that the OLA is necessary as a backstop for this sort of systemic risk, and Mnuchin demurred again. House Ways and Means Committee: Hearing entitled, "Increasing U.S Competitiveness and Preventing American Jobs from Moving Overseas," focused on the border-adjustment tax, 10 a.m. The American Enterprise Institute event on the CHOICE Act with House Financial Services Committee Chairman Jeb Hensarling, 11 a.m. The bill is Hensarling's overhaul of Dodd-Frank. House Budget Committee: Hearing on the White House fiscal 2018 budget with OMB Director Mick Mulvaney, 9:45 a.m.
House Ways and Means Committee: Hearing on the White House fiscal 2018 budget, with Treasury Secretary Steven Mnuchin, 10 a.m.
Senate Budget Committee: Hearing on the White House fiscal 2018 budget proposal with OMB Director Mulvaney, 9:45 a.m.
Senate Finance Committee: Hearing entitled "Fiscal Year 2018 Budget Proposals for the Department of Treasury and Tax Reform", witness is Treasury Secretary Steven Mnuchin, 10 a.m. Some contests and festivals can be exploitative. They may require large submission fees and then grab rights from the winning writers or photographers based on language in the submission contract. In some entry guidelines (for instance, in the Emerging Writer Awards), submitting an entry grants publishing rights. To reduce such exploitation, the Dramatists Guild has issued a statement on "Best Practices for Festivals and Contests". A good idea. Now it is up to contest organizers and playwrights today attention to these guidelines. Here is the one-page statement with the language of the release preceding it. ART BIZ | Ashawagh Hall 2018 Summer Space... Gone! Ashawagh Hall is an art gallery and village center. Photo by JT Marlin 2016. Ashawagh Hall is the center of Springs. It used to be owned by the Miller/Collins family, which lives across the road. They donated the original building to be used as a schoolhouse, with the understanding (they told me) that if the use of the building changed, the property could not be sold; instead, it would revert to the family. The Springs School moved to larger quarters (!) and Ashawagh Hall now doubles as an art gallery and a village hall. I have frequently reviewed community events there, such as the award to the late Herb Field last year. Hot Dots and Collage Credit (2016). Vito DeVito, East Hampton (2013). Over the years I have figured out the system for allocating space in the gallery, which is that members of the Springs Improvement Society on May 15 call in to reserve space at the gallery for the following year at 8:00 a.m., and everyone else calls in at 10 a.m. The instructions for 2017 are still shown on the Ashawagh Hall website, although the space that would be allocated on May 15, 2017 is for 2018. That system gives a little edge to long-term residents, members of the Society, and people who watch the calendar and the clock. A little quirky, but it seemed fair enough. As I checked out this year's timing, I find that this year it has changed. Artists calling on May 15 will discover that all the 2018 summertime space was already allocated. It was done during the winter. A special discount was reportedly emailed (to all members? to a list of artists?) in February. Sorry to be the bearer of this bad news if you were planning on something in 2018. If you think the change in the system is capricious, comment below or send me an email. 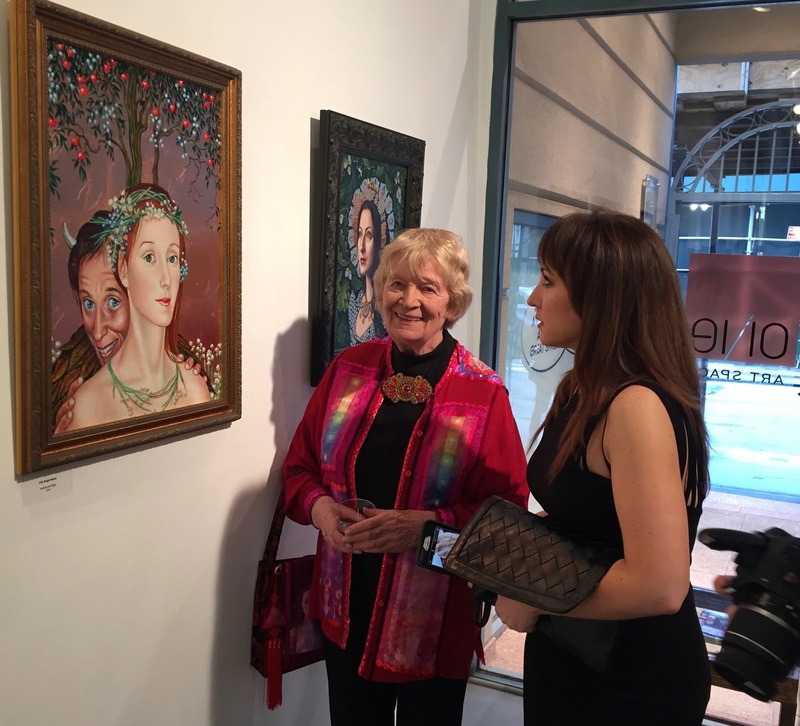 Multiple Points of View, One Inspiration — Ernst Fuchs. All photos by JT Marlin. 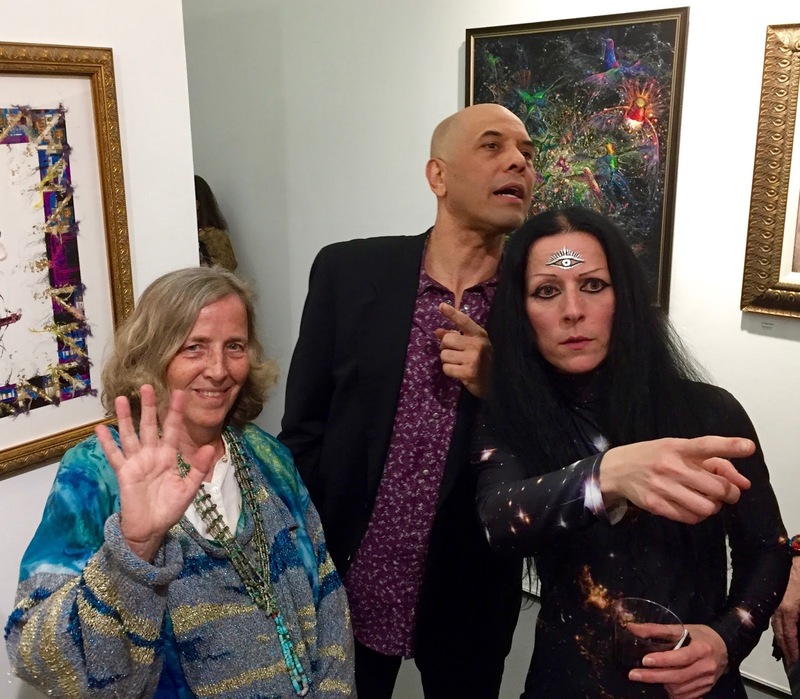 The "Visionary Alchemy" Exhibit opened with buzz Friday evening, April 29, at One Art Space at 23 Warren Street, New York City. The exhibition remained open until May 13. This gallery is a fine white cube — actually more of a white rectangular brick — half a block west of Broadway and City Hall Park. Phone 646-559-0535. In keeping with the theme of this blog, the Art Biz, I can report that the highest price for a painting in this Exhibition is $25,000 (#2 by Isaac Abrams) and the lowest is $280 (#27 by Marnie Pitts), a range of nearly 100 to 1. Artists Exhibiting, One Art Space, NYC. They are members of the Society for Art of Imagination. The 51 listed paintings and 48 listed artists came from all over the world — Austria, Belgium, Britain, Canada, Dom. Republic, Finland, France, Germany, Peru. U.S. painters came from the New York area and Ohio. They are all members of the Society for Art of Imagination, which was founded by followers of Austrian artist Ernst Fuchs. Brigid Marlin in front of her painting, #21B. Fuchs, which is German for Fox, is pronounced like "Looks" with an "F" (or listen to this). Fuchs viewed himself as the reincarnation of the great German Renaissance artist Albrecht Dürer (1471-1528). The exhibition is open Tuesday through Saturday, 11 am to 5 pm, until Saturday, May 13. 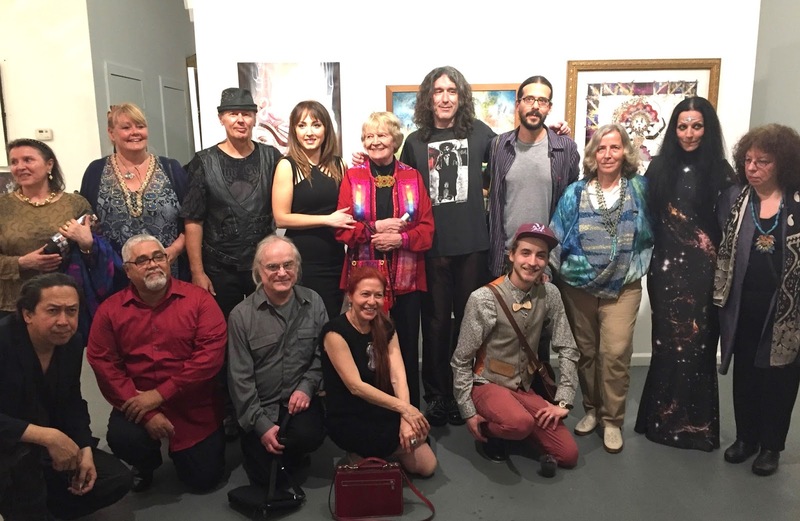 The Society for Art of Imagination is the successor group to Ernst Fuchs' own society, the Vienna School of Fantastic Realism, which he co-founded in the 1940s. If I may simplify, Fuchs and his colleagues in Vienna sought to explore spiritual fantasy using the hard-won schools of early Renaissance painters and engravers. The Vienna School expired with the death of Prof. Fuchs himself in November 1915. He became President of the Society of Art of Imagination before he died. He called Brigid Marlin, who founded the Society, "my best student". One Art Space is curated by Diego Ponce, who can be reached by email at curator@oneartspace.com. 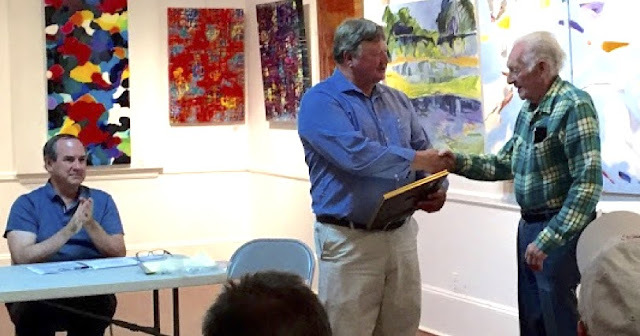 A catalog of the art show is available via email. The exhibition was co-curated by France Garrido, Olga Spiegel and Miguel Tio, who are leaders in the American Society for Art of Imagination. One of the visitors to the exhibition came up from Washington, D.C. She prepared the following video clip of her visit: https://quik.gopro.com/v/qYb7EXCmBR/.